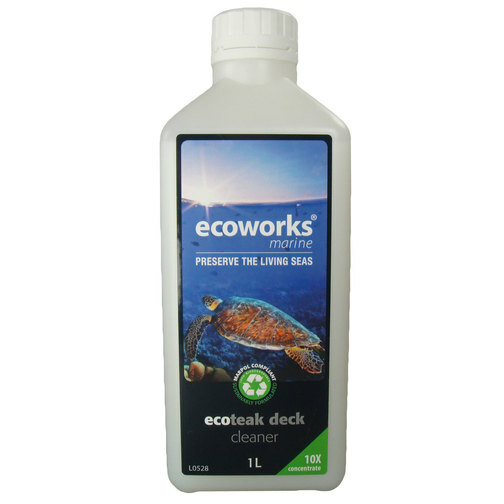 A biodegradable & environmentally friendly, low sudding teak and hardwood surface cleaner. It will remove ingrained and aged dirt stains in barewood surfacesproviding a clean, non-slip finish. 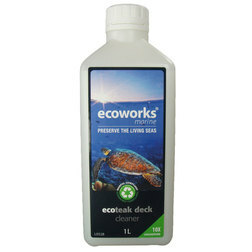 A biodegradable & environmentally friendly, low sudding teak and hardwood surface cleaner. It will remove ingrained and aged dirt stains in barewood surfacesproviding a clean, non-slip finish. This teak and hardwood cleaner has been bio-scientifically formulated to quickli cut through the toughest oil, grease, fats and dirt. A clever combination of indgredients work in synergy to provide an effective, multi-pronged attack in tackling oily soils and deposits. This boat cleaner is compliant to MARPOL Annex 5 1.7.5 and is declared not harmful to the marine environment. Developed with plant derived eco-solvent which effectively replaces conventional solvents whilst still providing excellent cleaning abilities and lasting shine. Effectively used on hardwoods, teak, GRP, plastics and painted surfaces.